Lucknow Sep 14 (IANS) Former Vishwa Hindu Parishad (VHP) President Praveen Togadia on Friday accused the BJP of coming to power by promising a Ram temple at Ayodhya in Uttar Pradesh but dumping the issue thereafter. Addressing a rally at the Janakpuri ground in Akbarpur he said: "They always said that we will build a grand Ram temple at Ayodhya when we come to power with a majority ... now four years have passed and look nothing has been done." "The BJP came to power at the Centre due to votes of crores of Hindus. Now they only remember the welfare of Muslim women... that s how they have betrayed you " the former VHP leader said. 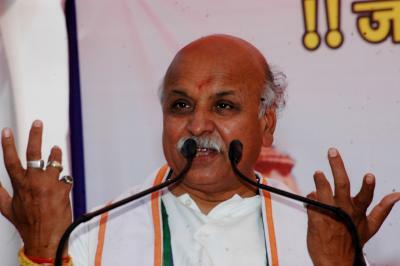 Togadia questioned the Bharatiya Janata Party (BJP) leadership that if a law could be enacted on the triple talaq issue why couldn t a law be made to facilitate the construction of the Ram temple.